1 If I install an APK from this website, will I be able to update the app from the Play Store? 2 Security: What measures do you take to make sure all uploaded APKs are real and created by the respective developers? 3 What is the purpose of ApkZilla.info? What APKs are accepted? I just uploaded an APK but it’s not going live. 4 Why did I just get an error when trying to install an APK? 5 Why can’t I press the Install button? It’s grayed out on my Android device! 6 I have an APK I want to upload. How can I extract it from my device and upload to ApkZilla.info? 7 Do I need to be rooted to extract an APK from my device? 8 Does ApkZilla.info host paid or pirated apps? 9 What are these weird terms I’m seeing on some APKs – dpi, nodpi, arm, arm64, x86? 10 If there are both nodpi and specific dpi APKs available, which one should I download? 11 How can I find out my device’s DPI, architecture, screen size, and other specs? 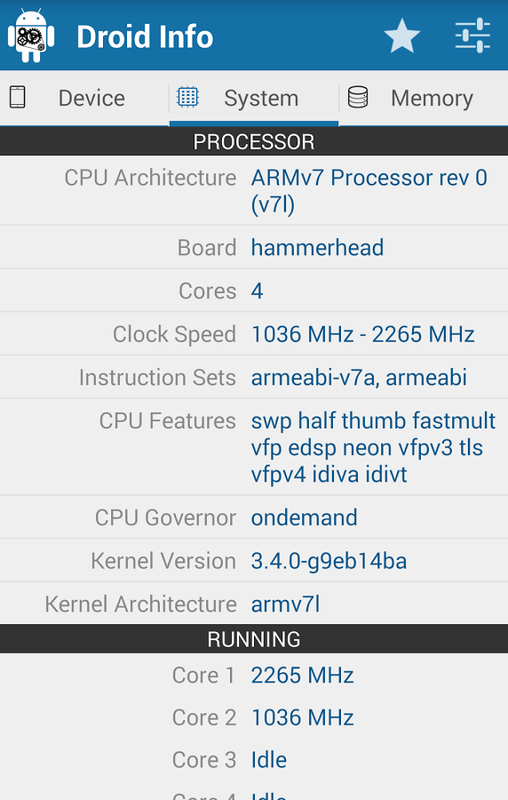 12 Is it OK to install arm64 apps on an arm device? What about arm apps on an arm64 device? Likewise, for x86 and x86_64? If I install an APK from this website, will I be able to update the app from the Play Store? Yes, absolutely. The Play Store installs APKs it downloads from Google’s servers, and sideloading from a site like ApkZilla.info goes through a very similar process, except you’re the one performing the downloading and initiating the installation (sideloading). As soon as the Play Store finds a version of the app newer than the one you’ve sideloaded, it will commence an update. Security: What measures do you take to make sure all uploaded APKs are real and created by the respective developers? All ApkZilla.info uploads are verified prior to publishing. We make sure that the cryptographic signatures for new versions of all previously published apps match the original ones, which means we know if uploaded APKs were signed by the real devs or someone pretending to be them. Note: ApkZilla.info has been protected from the Janus vulnerability in Android . a. For new apps that have never been uploaded to ApkZilla.info, we try to match the signatures to other existing apps by the same developer. If there’s a match, it means that the same key was used to sign a previously known legitimate app, therefore validating the new upload. b. If we see no matches, we try to obtain and compare to a version of the same app from the Play Store or another verified location. If it’s a beta, we will try to get into it. If we can’t, we will attempt to contact the developer. c. If we’re unable to verify the legitimacy of a new APK, we will simply not publish it. What is the purpose of ApkZilla.info? What APKs are accepted? I just uploaded an APK but it’s not going live. Allow updates to popular apps that are rolling out slowly and may not yet be available to you to be downloaded and installed sooner. Get around geo-restrictions and sideload popular apps that may not be otherwise available in your country. Provide an archive of popular applications along with changelogs and descriptions, so that you can roll back to an earlier version if a new one starts crashing or removes features you’ve grown to enjoy. You can also use the archive for research purposes to compare changes from one version to another, for example. Allow for alternate distribution of select applications, at the discretion of our management and editorial teams. As you can see in the above list, #4 is in the last place. One of ApkZilla.info’s signature features is careful curation, so, statistically, most new apps that get uploaded will likely get denied, depending on circumstances. If your app is new, doesn’t have a proven track record, and not unique, it will likely not be approved. If the app is in beta, lacks a meaningful description or any arguments for why it should be accepted (or we can’t verify its legitimacy), it will likely not be approved. If you don’t have credibility as a developer (existing popular apps, notoriety in the field, etc), your chances of getting approved go down. We get hundreds of uploads each day, there are millions of apps out there, the majority of which (if we’re being frank) are not very good, and we simply have no other choice but be selective. We hope you understand why. Why did I just get an error when trying to install an APK? with a cryptographic signature that doesn’t match the already installed one. All APKs hosted on ApkZilla.info are signed with official release keys, so make sure the app you’re trying to update was not previously re-signed. with a version lower than the one already installed. In other words, you’re trying to downgrade without uninstalling the current app first. with libraries meant for a device with a different CPU architecture. For example, if you’re using a 32-bit arm device, you’ll get an error trying to install an APK with arm64 libs inside. However, 64-bit OSes are backwards-compatible with 32-bit ones, so you should have no issues installing APKs with arm libs on an arm64 device. Why can’t I press the Install button? It’s grayed out on my Android device! Disable any screen-dimming apps, like Lux or Twilight. For security reasons, Android will gray out the Install button when an app like that is active. See this HowToGeek article for more info. I have an APK I want to upload. How can I extract it from my device and upload to ApkZilla.info? The easiest way to extract an APK is by using an APK extractor app built for this purpose, or a file manager with extracting capabilities. For example, ML Manager APK Extractor, APK Extractor or Apk Extractor Lite. If you insist on going in manually, remember that pre-installed read-only versions of system apps live in /system/app, but updates to them as well as new apps are in /data/app. Do I need to be rooted to extract an APK from my device? No, you do not need root if you use an APK extractor app. Note: If you insist on a manual method and try to browse /data or /data/app, you’re going to have a bad time without root, as Android won’t let you list the dirs. You’ll need to know the exact name of the APK file to pull it. Does ApkZilla.info host paid or pirated apps? ApkZilla.info has a no-piracy policy and does not host paid apps. Note: There are very rare exceptions to the no paid apps rule. Sometimes, developers make updates to paid apps available to the public, usually to test beta releases. In such cases, there is usually a license check involved to make sure the apps were previously purchased. MX Player Pro is a notable example of such an exception because J2 Interactive, the app’s developer, provides test APKs on its site. What are these weird terms I’m seeing on some APKs – dpi, nodpi, arm, arm64, x86? DPI: screen density, measured in dots per inch. Each device has a certain DPI metric, and some APKs are optimized for specific DPIs. nodpi: APKs marked nodpi, or not marked with any DPI-related info at all, are meant for all devices. 120, 160, …, 640 dpi: these APKs are meant for specific DPIs only. See the next several questions for more details. arm (armeabi, armeabi-v7a), arm64 (arm64, arm64-v8a), x86, x86_64, mips, mips64: these are CPU architectures. See this FAQ entry for more info. Update 1/23/18: HowToGeek published a detailed explainer here: How to Find Your Android Device’s Info for Correct APK Downloads. If there are both nodpi and specific dpi APKs available, which one should I download? If you’re confident of your device’s DPI (dots per inch) value, go ahead and download the APK that most closely matches it. If there is no exact match, pick the APK with a higher DPI than your device, if available. If not, you’ll probably be alright with a slightly lower DPI. Otherwise, it’s safe to download the nodpi variant – it essentially contains resources that should look right on any device. The only downside of a nodpi APK is that it’s almost always larger in size since it’s not optimized for a specific DPI. Rule of thumb: When in doubt, go for nodpi. How can I find out my device’s DPI, architecture, screen size, and other specs? 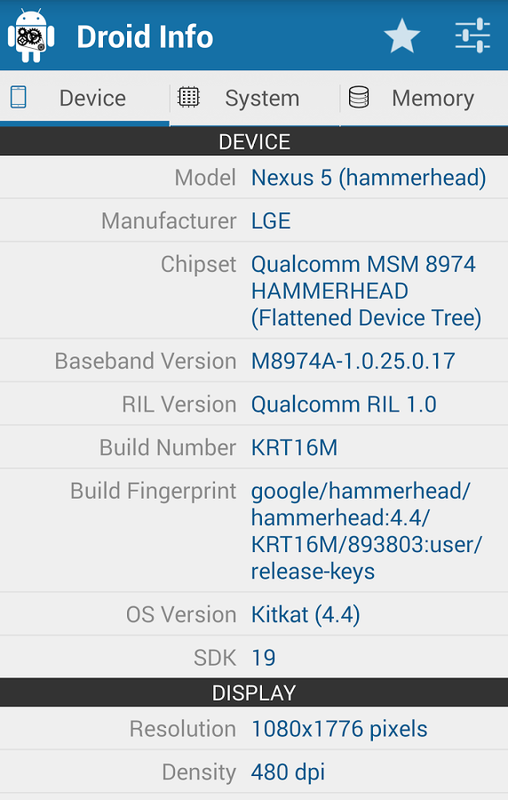 After trying numerous system info apps, we are currently recommending Droid Hardware Info. It contains the DPI (Device tab), architecture (System tab), Android OS version (Device tab) as well as a plethora of other info. Is it OK to install arm64 apps on an arm device? What about arm apps on an arm64 device? Likewise, for x86 and x86_64? Since 64-bit operating systems are backwards-compatible with 32-bit apps, but not vice versa, it’s safe to install 32-bit apps on both 32-bit and 64-bit OSes, but not the other way around. 32-bit APKs installed on 64-bit devices may not be as optimized, so if you have a 64-bit device, install a 64-bit APK when it becomes available, if it exists at all. Many developers simply don’t bother building 64-bit-optimized APKs. arm on arm device: OK.
arm64 on arm device: Nope. Same for x86 and x86_64, mips and mips64, etc.